Find out how by clicking the button below. The Humber Junior Squash Academy is a partnership of local squash coaches and clubs who are committed to providing a high quality service for junior squash players across the Humber sub-region (Kingston upon Hull, East Riding of Yorkshire, North Lincolnshire & North East Lincolnshire). Our aim is to develop junior squash players skills, give them access to more squash opportunities and let them experience competitive sport. Ultimately the Humber Junior Squash Academy is dedicated to making young people quality squash players of the future. All young people involved in any of the above clubs/activities will be invited to attend a range of Humber Junior Squash Academy activities throughout the year to include tournaments, academy training sessions and ranking days. Club coaches will invite young people to activities they deem appropriate. 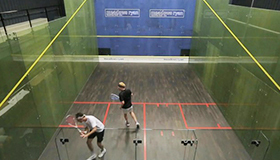 The Humber Junior Squash Academy works closely with Yorkshire Squash & England Squash – for further information on the player pathway from local to national progression please click on the coaching page or contact your coach. Check out some drills, tips & routines to help you improve your game. Also take a look at the coaching page to see where the Academy coaches take their classes.